What is the Launch Kit? The explosive growth of the Sticky Faith movement marks the dawning of a new era in ministry with young people. An increasing number of youth leaders, pastors, and parents are embracing Sticky Faith principles and practices as a response to the mass exodus of teenagers and young adults from the church. But Sticky Faith is not a “quick fix” solution. Through our intensive work with churches nationwide, the FYI team has developed a proven process to help you lead change in your ministry. We’re sharing all of this with you in the Sticky Faith Launch Kit. Much more than a book, this field guide puts tools in your hands for the next 180 days with four key groups: your core team, volunteers, parents, and the entire church. ⑩ All wrapped in a tested and proven process to implement Sticky Faith in your church! 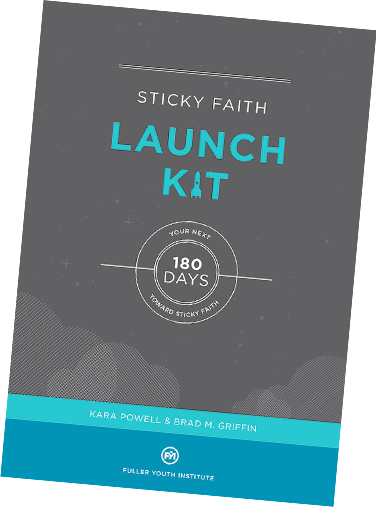 ⑫ The entire Sticky Faith Launch Kit with complete access to online resources and community is only $30.00!